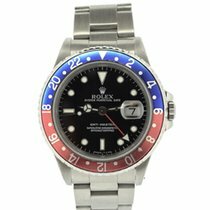 Rolex introduced the red and blue bezel on the Rolex GMT-Master now commonly known as the "Pepsi." It quickly became one of the Swiss luxury watch manufacturer's most beloved models, not least of all due to its high quality and second time zone. In the mid-1950s, the American airline Pan American World Airways (Pan Am) needed a watch with a second time zone. Rolex created the GMT-Master (GMT standing for Greenwich Mean Time) for the airline in 1954. The watch features a bidirectional 24-hour bezel and a second hour hand. The second hour hand makes one full rotation per day and displays another time zone in conjunction with the bezel. This feature is ideal for pilots, businessmen, and politicians. The "Pepsi watch" has a red and blue bezel, which earned it its nickname, as the Pepsi logo uses the same color combination. The bicolor bezel has a practical use: The red half symbolizes day while blue represents night. One glance is enough to differentiate between night and day in the second time zone. The first GMT-Master II, introduced in 1985, featured a red and black bezel. Therefore, it's nicknamed the "Coke watch". 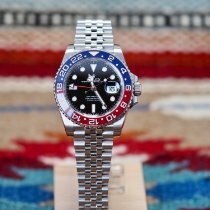 How much does a Rolex Pepsi cost? Across the 60-year production period, Rolex released the GMT-Master in a variety of colors. 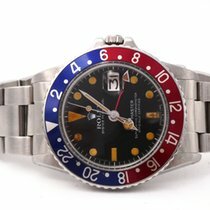 However, the combination of a black dial with a blue and red bezel remains the most popular among Rolex fans and collectors. Early models, such as the first GMT-Master with the reference number 6542 and its successor, the ref. 1675, are especially highly coveted. The former was only manufactured from 1954 to 1959 and lacked a crown protector. In the beginning, its bezel was still made of plastic Bakelite, which tended to break and was quickly replaced by aluminum. Plan to spend around 43,200 USD on a ref. 6542 in good condition. 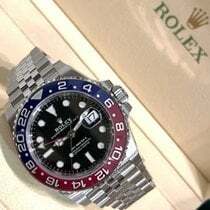 Its successor model with the reference number 1675 was part of the Rolex catalog for more than 20 years and is one of the most sought-after Pepsi models today. Unlike its older sister model, it features a crown protector and was outfitted with the caliber 1565, which was later replaced by the caliber 1575. Depending on its condition, plan to spend between 14,900 and 32,500 USD on one of these watches. Rolex introduced the GMT-Master with the reference number 16750 in 1981. It was powered by the caliber 3075, which provided it with a stop-seconds mechanism and a Quickset function for the date. It also had improved water resistance – from this model on, all GMT-Masters were water resistant to 100 m (10 bar, 328 ft). Set aside around 11,000 USD for a never-worn piece from this series. Pre-owned models are slightly less expensive at about 10,500 USD. 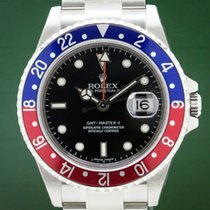 Only a few years later, Rolex added the GMT-Master II with the reference number 16760 into the mix. Thanks to its somewhat thicker case, Rolex fans dubbed this model the "Fat Lady." Rolex equipped this watch with a black and red bezel, meaning it isn't technically considered a Pepsi, but rather a Rolex Coke. Nevertheless, it brought with it certain features that would also be significant for future Pepsi models. For example, the caliber 3085 made it possible to display three time zones at once. In addition, Rolex provided this watch with a larger crown protector and replaced the Plexiglass with sapphire glass . You can get a "Fat Lady" in fine condition for around 9,700 USD. The next stage in its evolution followed in 1989, with the reference number 16710. Rolex first outfitted this timepiece with the caliber 3185 and later with the caliber 3186. This watch is markedly thinner than the "Fat Lady" and came with neither the Pepsi nor the Coke bezel. Instead, it came with a blue and black Batman bezel, a reddish brown root beer bezel, or a black bezel. These watches were also the first to use SuperLuminova as the luminous material instead of tritium. You can purchase a pre-owned model in good condition starting at about 9,000 USD. Never-worn pieces start around 13,000 USD. 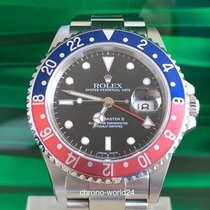 In 2014, Rolex rereleased a GMT-Master II with a Pepsi bezel, which can be found under the reference number 116719 BLRO. This model is only available with an 18-karat white gold case . What's more, the Swiss watch manufacturer furnished it with a Cerachrom ceramic bezel, a triple-sealed Triplock crown, and a so-called "maxi dial" with enlarged, glow-in-the-dark indices. The chronometer-certified caliber 3186 with a Parachrom hairspring ticks away inside this watch. One of these watches costs about 32,500 USD new and 30,200 USD in very good condition. In 2018, Rolex began offering this timepiece with a blue maxi dial instead of the previous black dial. This new model is priced at 41,200 USD. 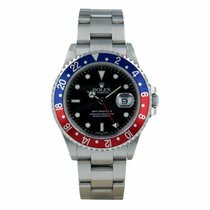 At Baselworld 2018, Rolex announced that they would be adding a stainless steel GMT-Master II with a blue and red Cerachrom Pepsi bezel (ref. 126710BLRO) to their catalog. In addition to the material and slightly altered case design, the watch manufacturer also made changes on the inside of this model. It is now powered by the in-house caliber 3285, which comes with their patented Chronergy escapement. Thanks to the use of a nickel-phosphorus alloy, this escapement is not only unaffected by magnetic fields, but also much more efficient. The Jubilee bracelet made of so-called "Oystersteel" stainless steel is also new. This GMT-Master II in stainless steel was released in spring 2018 for a price of 10,400 USD. If you frequently travel through different time zones, you already appreciate the advantages of a GMT watch. In no time at all, you can know what time it is in a second time zone thanks to the 24-hour bezel and second hour hand. Wearers frequently set this to their home time. The three traditional hands for hours, minutes, and seconds display the local time. The bicolor Pepsi bezel helps you differentiate between night and day. Therefore, you always know the perfect time to make a phone call home. Reading the second time zone using the 24-hour bezel is fast and easy. The bezel has 24 markers that correspond to the 24 time zones. You can set the bezel with a few turns (clicks) to any time zone in the world. The only requirement is that the hour hand is set to Greenwich Mean Time in London. For example, when it's 14:00 (2:00 PM) in San Francisco, the GMT hand points to 22:00 (10:00 PM) on the bezel, which is set to zero. The time difference between London and San Francisco is eight hours. If you're in Central Europe and want to know how late it is in San Francisco, then you turn the bezel eight clicks to the right. If you want to know what time it is in a time zone east of GMT, then you have to turn the bezel to the left. To tell the time in Moscow, you turn the bezel left three times. For Hong Kong, you turn it eight times to the left. Since the introduction of caliber 3085 in the GMT-Master II, you can set two time zones without turning the bezel. First, you unscrew the crown counterclockwise. Then, you pull it into the second position, where you can set the hour, minute, and 24-hour hands. You can set the local time, or the central hour hand, with the crown in the first position. The hand jumps from hour to hour. You can also set the date in this position. 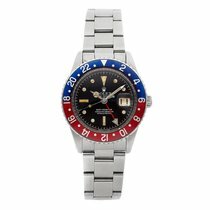 The Rolex Pepsi is a member of the Oyster sports watch collection. With its distinctive red and blue bezel, the Pepsi is one of the most striking GMT-Master models. Watches such as the Submariner, one of the first diving watches in the world, have also become watch icons. Just as distinctive are the green Submariner models, also known as the "Hulk" or "Kermit." The Hulk features a green dial and bezel, while the Kermit only has a green bezel. The Pepsi and the Submariner both have 40-mm Oyster cases and three-piece link Oyster bands . Due to safety reasons, the Submariner's bezel can only be turned counterclockwise. Divers use the bezel to keep an eye on their dive time. The first 15 minutes have individual minute graduations. Altogether, the bezel covers a time span of 60 minutes. The Rolex Daytona, the Swiss manufacturer's chronograph, is the perfect stopwatch. It has a diameter of 40 mm. The bezel features a tachymetric scale so you can determine speed over certain distances. The small seconds is located at six o'clock, the 30-minute counter at three o'clock, and the hour counter at nine o'clock. The Daytona is available in stainless steel, bicolor (stainless steel and yellow gold), or in solid yellow, white, or Everose gold. There is also a solid platinum model, which has a Cerachrom bezel. This type of bezel has been used with the stainless steel models since 2016.